Prickly and Bitter: If the spines don't get you, the latex will! The crown of thorns is native to Madagascar, as are many species of Euphorbia. There are an estimated 100 species in the genus, but I have my doubts that they all belong. There seems to be a group of about 40 species that are native to Madagascar (some are critically endangered, some or more common but all are at risk due to habitat destruction), another group that are native to mainland Africa, and then yet another group that are native to Europe and South America (to see an example of the morphological variation in the family, read all about the chenille plant HERE). The plants native to Madagascar are very similar to the one pictured above; small-ish brightly-coloured flowers, very thick green leaves that are concentrated at the tips of the stems, long spines, and are relatively low to the ground. The ones native to Africa are trees; some can be up to 35 feet tall but otherwise similar to the Madagascar euphorbs. The plants native to Europe and South America are the weird ones; they're the round, "blobby" euphorbs that look absolutely nothing like their African "relatives". It wouldn't surprise me at all if there ended up being multiple genera within Euphorbia and a lot of renaming of species in the years to come. There are currently four sub-genera, but even those don't quite seem to be natural groups, at least to my untrained eye. I'm going to lay my bets on there actually being six genera within Euphorbia. We'll see if I'm right; I'll re-evaluate this blog if there's ever a genus-wide systematic DNA analysis that's performed. 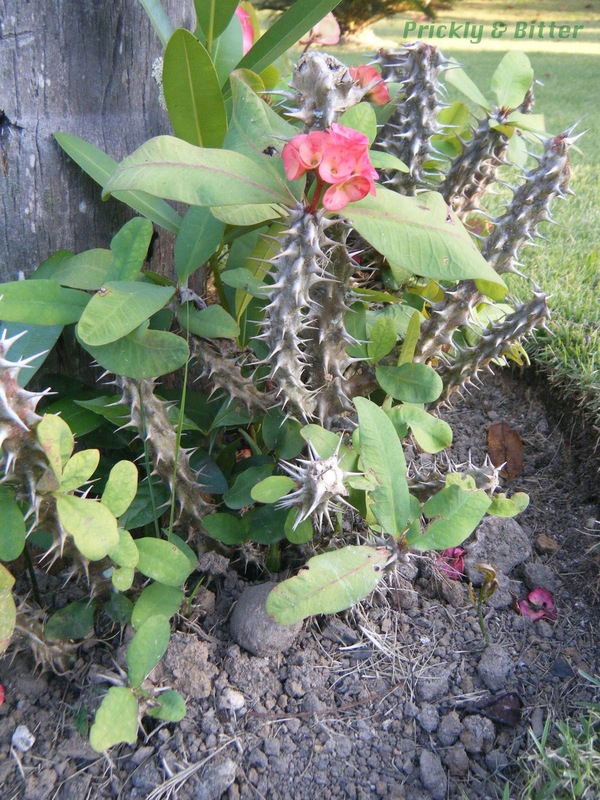 The crown of thorns is a species that has a rather unique common name, due to its hypothesized role in Christian and Catholic beliefs. The story goes that when Christ was nailed to the cross, he was also forced to wear a crown made of a very thorny plant; whenever there's a painting depicting Christ's crucifixion, his head is always bleeding from the thorns digging into his forehead and scalp. It is believed based on geological evidence and stories passed down through generations (as well as artifacts discovered in Mosques and in underground burial tombs) that this plant was transported to the Middle East very early on; as many as 5,000 years ago. 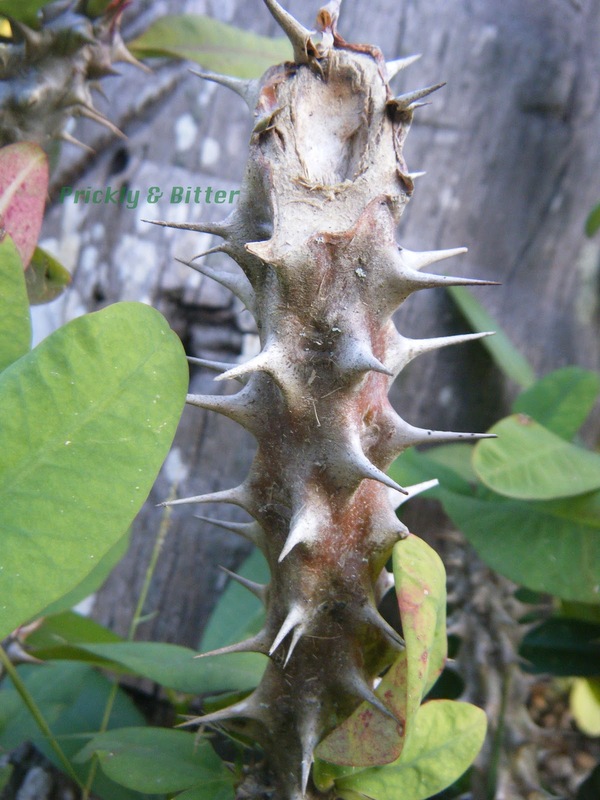 The story goes, then, that this plant is the source of the thorny branches that made up Christ's "thorn crown" during the crucifixion. The story of Br'er Rabbit, Br'er Fox and Br'er Bear courtesy of Disney also revolves around a dense thicket of thorns (I only know this because of the ride Splash Mountain at Walt Disney World in Florida...), and it's highly likely that these are some sort of euphorb (the story is based on folk tales told by African slaves after first being transported to the United States, so its doubtful the plants making up the Brier/Briar Patch would be American species) or other African spiny species. All euphorbs are highly toxic. 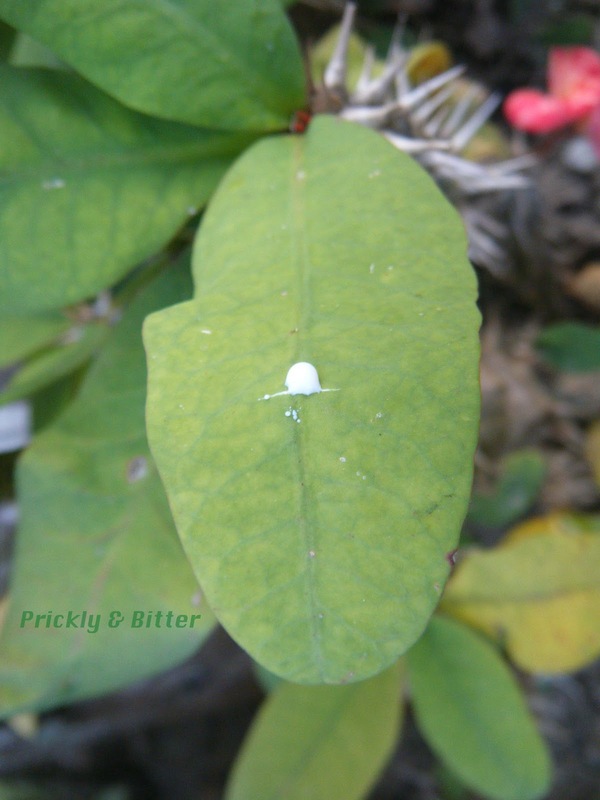 Some are more irritating only to the skin, while others produce noxious fumes from their latex (the white milky substance that is released when any part of the plant is damaged, as you can see in the third picture) and can cause severe respiratory problems. If ingested, this species won't kill you but will most definitely make you sick (vomiting, diarrhea and severe dehydration as a result of these two). African species can cause death just from contact with the latex, let alone ingestion. It's amazing the kinds of defence systems that some plants have evolved! 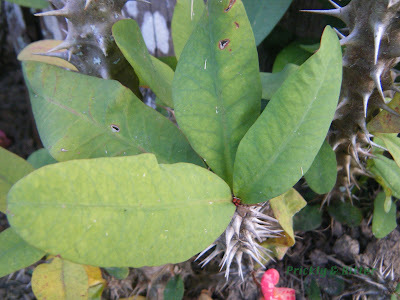 Unsurprisingly, it is rare to find any kind of insect or other animal herbivore munching on these plants as a snack. The flowers of this plant are quite neat, and you can actually gauge the age of the flower bracts by their colour. What we see as "flowers" aren't actually flowers at all. 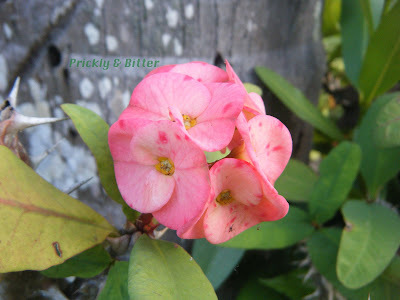 The two "petals" are modified leaves called bracts that contain chromoplasts instead of chloroplasts, which give the bracts their red to pinkish hue. These bracts change colour as they age, and the rate at which they change colour depends on the amount of sun they're exposed to and how long the bracts have been fully-developed. They usually start off a bright pink or red, then gradually fade to completely green before the fruit is mature, then the bracts fall off. Those small yellow patches on the very inside of the flowers are the true flowers; the fruit of these plants is rarely larger than a few millimetres across and is red when mature. Another great blog . As always you end up "learning" me stuff.